No drawers, no counter space, and no floor space? No problem. 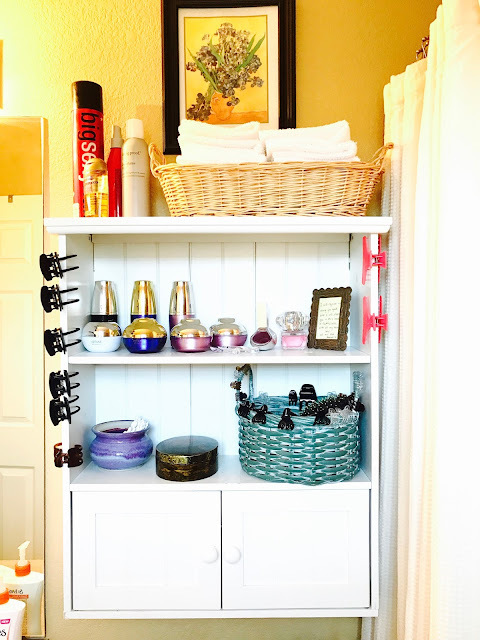 I have a teeny bathroom in my house, and I'm not exactly a low-maintenance girl who gets by on one all-purpose moisturizer and a swipe of lip gloss. I have two different skin care lines I use, a ton of makeup, lots of hair care items and accessories, and a complicated dental routine involving both an electric toothbrush and a waterpik. 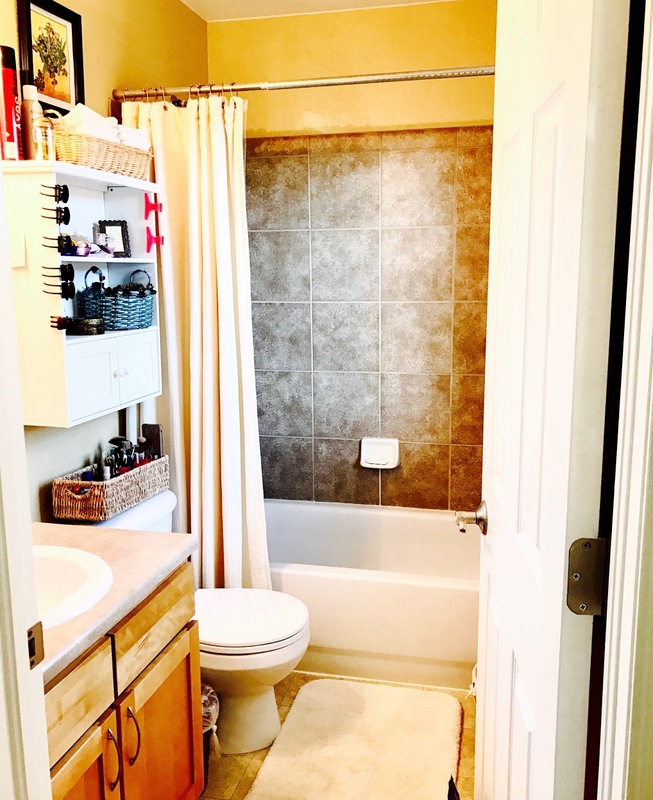 I want my bathroom to be utilitarian as well as a soothing, spa-like place to be, with all my bath essentials within easy reach. 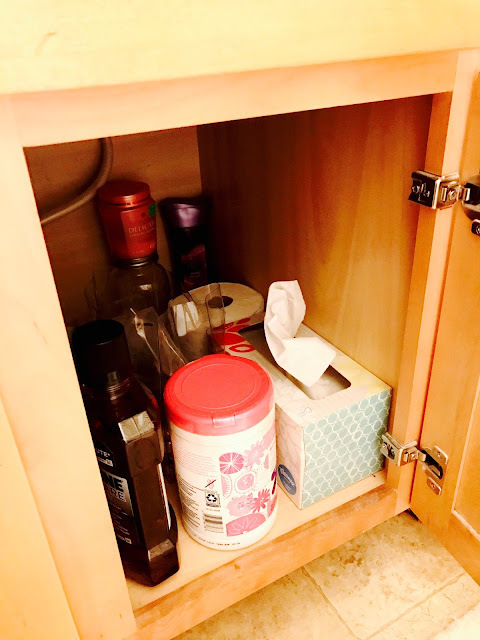 I have no counter space, barely any cabinet space, no drawers, and no floor space for an extra piece of furniture like a cabinet or shelving unit. I'm about to reveal to you how I organize and store all my stuff in this itty bitty space, in the hopes that if you too live with a minuscule-sized bathroom, you can make it work better for you. If you have no floor space, you have to use your walls to your advantage. I have a cheap over-the-toilet cabinet that I got at either Walmart, Target, or Bed Bath and Beyond years ago. It has three open shelves if you count the top as a shelf (which I do) and two little doors that I can hide random bottles and miscellaneous behind. This thing is a workhorse. It holds my hair products, my basket of washcloths, some of my skin care, my perfumes, my hair accessories and brush, my Q-tips and cotton pads, my deodorants, clippers, medicines and lotions, nail polish remover, Bag Balm container (for my lips,) and Lord knows what else behind the little doors. Cabinet with doors open. Do I really need 4 deodorants? Apparently I do. I also use it to hold my hot roller hair clips, which I attach to the sides of the cabinet. When you mount this cabinet on the wall, you want to leave enough space between it and the toilet to be able to place a basket or container of some sort on top of the toilet lid. 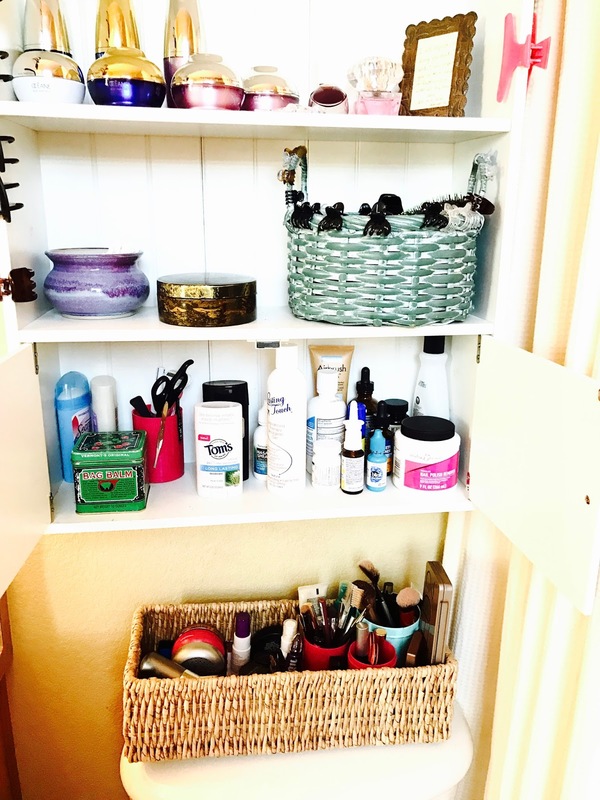 That basket is where I keep my makeup. I got this rectangular basket at Walmart years ago in their bathroom accessories section, where you get shower curtains, matching trash cans, toothbrush holders, soap dishes, etc. I think it was less than $10. Then I filled it with little boxes, plastic pencil cups, and a tea tin to organize my compacts and brushes. I literally just scavenged around the house for whatever I could find that would hold makeup and placed it in this basket like a Tetris puzzle. Most of the little boxes are small gift boxes and lids, like for jewelry and such. 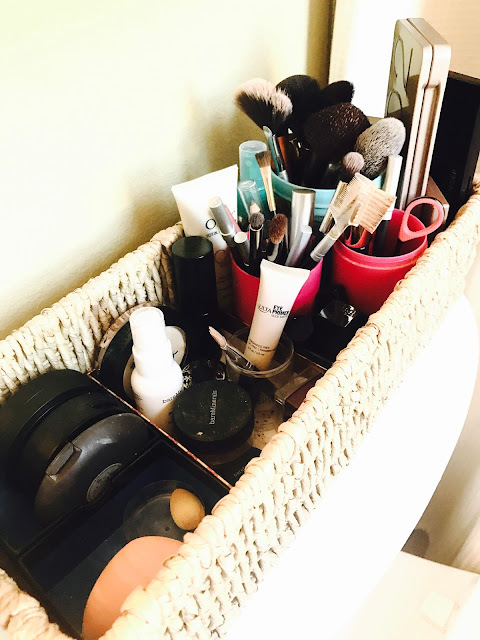 When I get ready in the morning, I move this basket to the sink and prop it on the right side of my non-existent counter space, use the items I need, then stash it back onto the toilet lid out of the way. The basket on top of my cabinet that I store clean washcloths in is technically a bread basket (like for a loaf of french bread) and came with a gift in it years ago. Like most of my baskets, it was just one I had lying around the house. 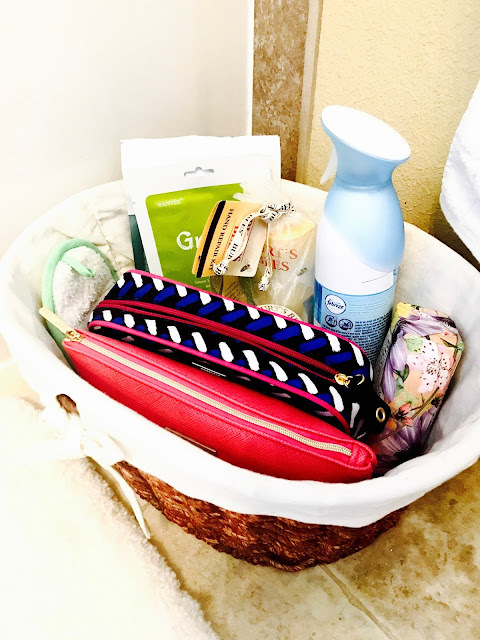 If you don't have any lying-around-the-house baskets, you can find inexpensive ones of all different shapes and sizes at places like Hobby Lobby or Big Lots. Yet another basket, this one for hair accessories and my brush. 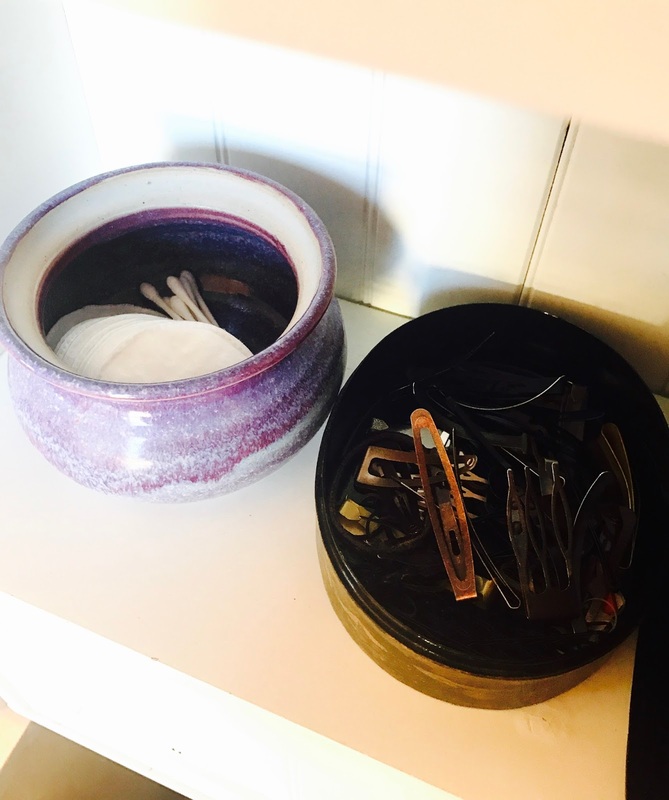 I use another couple of random, lying-around-the-house containers to hold my Q-tips, cotton pads, and hair clips and bobby pins. The purple ceramic one was a lidded container I impulse-bought at a craft and art show years ago and never really knew what to do with, and the black lacquer container was something I bought to decorate my apartment years ago when I was into Asian-looking decor. Q-tips, cotton pads, and hair clips. The point is, scavenge around your house for decorative knickknacks and baskets that have no purpose and are probably collecting dust, fill them with the bathroom items you use every day, and store them on the cabinet shelves over the toilet. 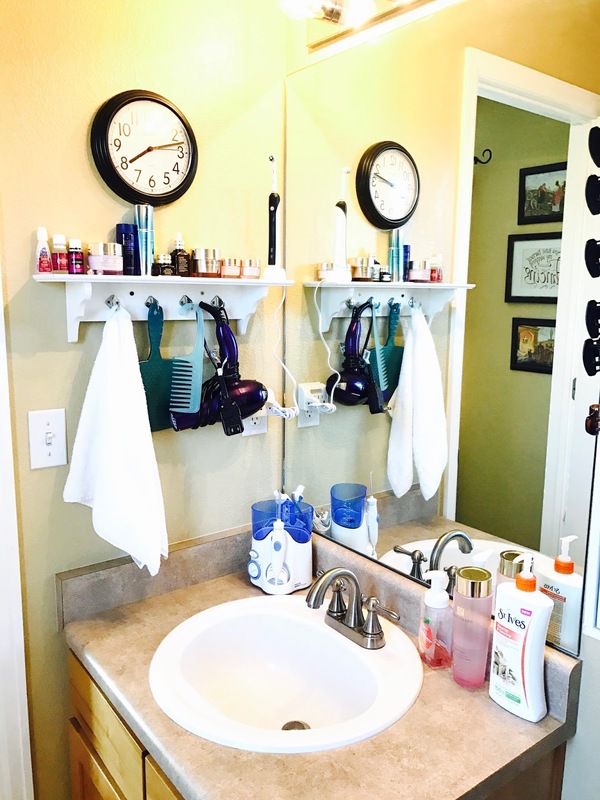 If you have no counter space, what you need here is a small shelf with 3-4 hooks underneath that you can mount on the wall beside the sink. I got this one at Big Lots years ago for around $10 as I recall. Literally no space on that counter for anything. Must use wall! This is my grab-and-go section. On the hooks below, I always cut a hole in my handtowels so I can hang them on the first hook (yes, they fray a little around this hole, but the towel holds together and still hangs great for years and years.) 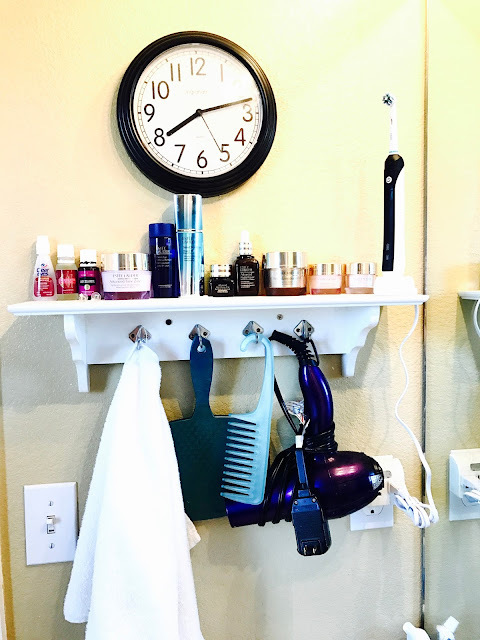 I use the other hooks for a mirror, a comb, and my blowdryer. Left side, under my sink. More baskets. Under my sink, right side. Just more bathroom stuff. I'm not done with baskets. I also have one on the floor beside my tub. This basket holds my feminine supplies (in the pink makeup bag,) my battery-powered face scrubber and its attachments (in the blue/black/pink/white makeup bag,) air freshener, a couple of recent gifts (the Burt's Bees hand care set and a fancy wrapped bar of soap,) plus my exfoliating mitt and my packaged face masks that I always stock up on at the Daiso $1.50 Japanese Store when I travel to Huntington Beach. 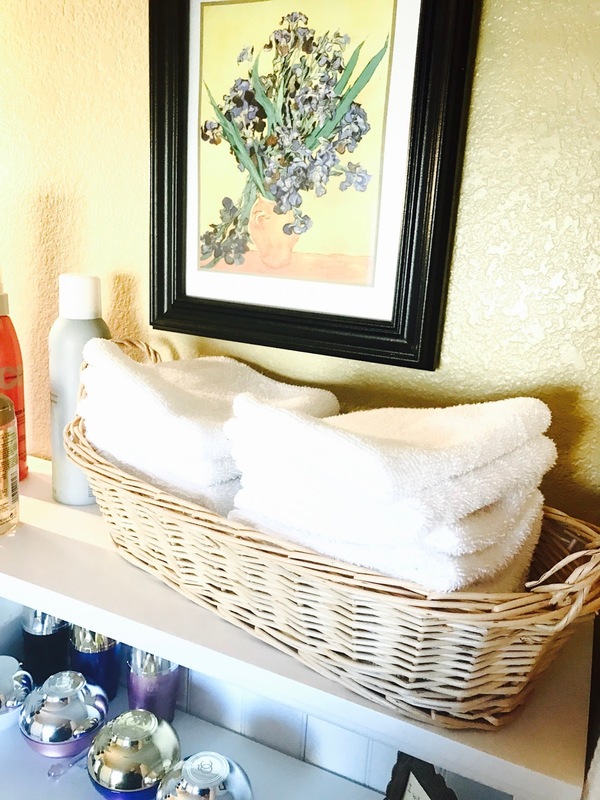 I know everybody has a shower caddy, but for an organized small bathroom, I recommend you keep it cleaned out and minimal, stocked with only the products you are currently using. 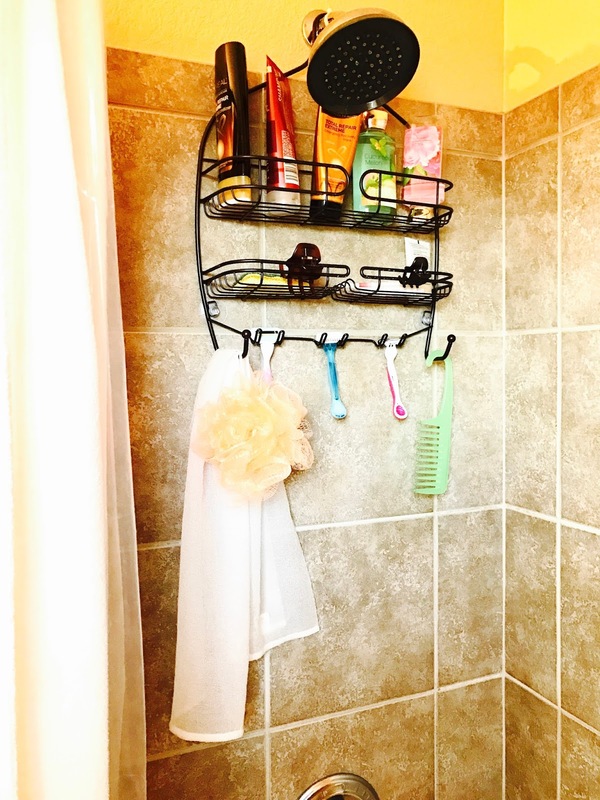 My shower caddy. Yes, there is another comb in here so I can comb conditioner through my hair when I'm not feeling too rushed or lazy to do so. You don't have to throw things away that you aren't currently using. 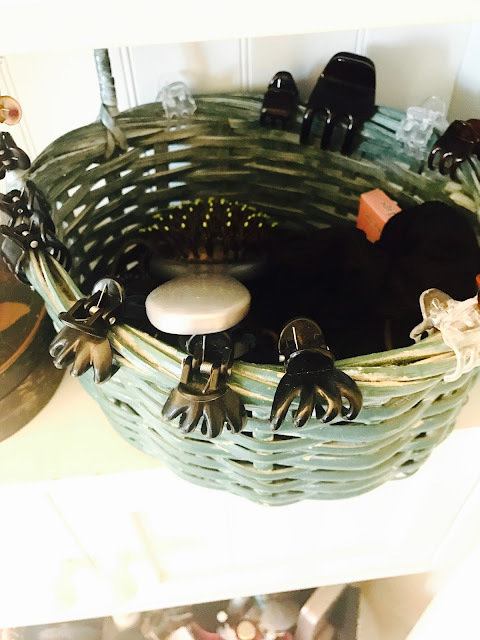 Keep them in the baskets under the sink or in a basket in a linen closet, if you have one. I cycle out body washes and shampoos I'm tired of when I get a new one I want to use instead, and then go back and use the rest of the old ones when I run out. So that's it! 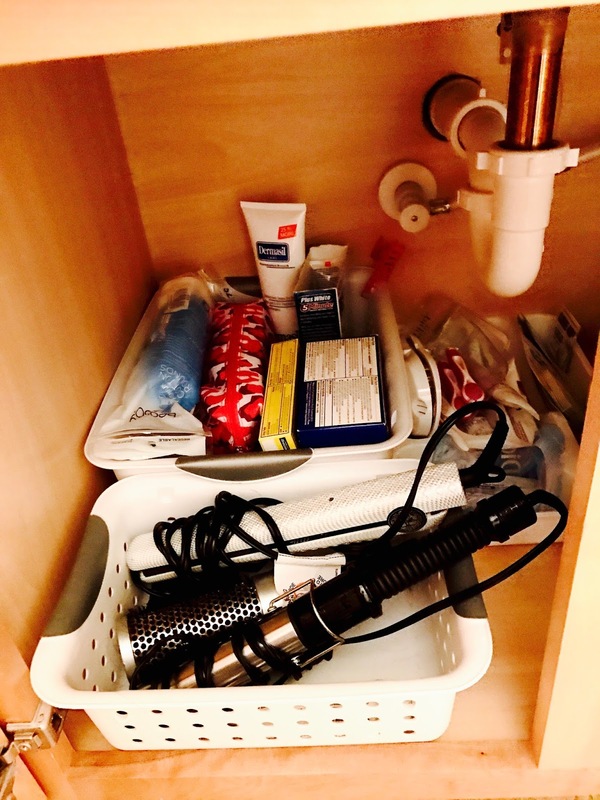 My teeny tiny bathroom and the multitude of items it stores. 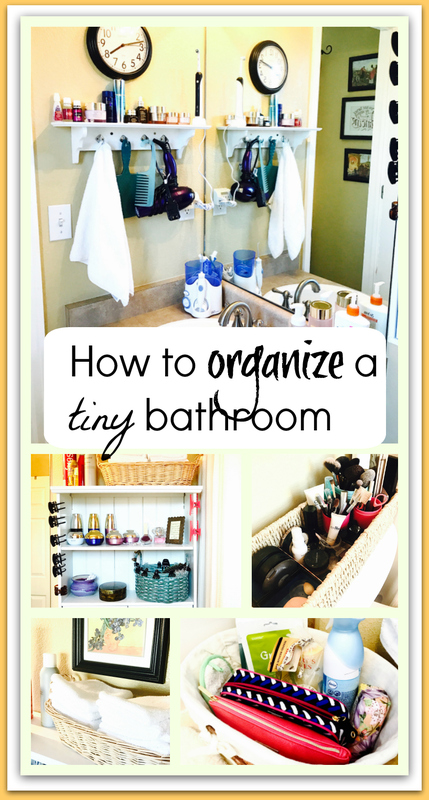 If you have a large bathroom with plenty of counter space, lucky you, but if not, I wish you lots of luck in organizing your tiny space. Let me know how it goes in the comments!